Did you know that the average American eats 6 pounds (almost 3 kg.) of peanut products per year! There are actually four types of peanut: Valencia, Spanish, Runners, and Virginia. Of these, many peanut aficionados claim that Valencia peanuts are the best to eat raw or boiled. If you are only familiar with peanuts in the form of peanut butter or ballpark snack, you may be wondering what are Valencia peanuts? 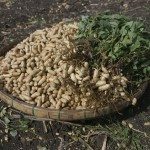 Read on to find out how to grow Valencia peanuts and other info on Valencia peanut varieties. Valencia peanuts have three to six small red-skinned seeds per shell, each with a sweet flavor. Valencia peanuts are found growing for commercial use in New Mexico and account for less than 1% of the United States production of peanuts. Their sweet flavors make them a favorite for boiled nuts and are also often used for all-natural peanut butter. When roasted, Valencias come close to achieving the crispness of Spanish peanuts. 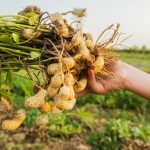 Referred to as ground nuts, monkey nuts and goober, peanuts are natives of South America and, as such, are generally regarded as a warm climate crop. That said, wild strains of peanut (Arachis hirsuta or hairy peanut) have been found in the chilly high altitudes of the Andes Mountains. Peanuts have been cultivated for at least 3,500 years. Valencia peanuts produce smaller kernels and yield less than Virginia peanuts. Most Valencia peanut varieties mature in 90-110 days while Runner and Virginia types need 130-150 days to reach maturity. While Valencia peanuts are usually found growing in the warm region of New Mexico, they have been cultivated as far north as Ontario, Canada. Peanuts prefer sandy, loose, well-draining soil. Do not sow peanuts after potatoes or beans have been grown in the plot, as they are susceptible to the same diseases. Prepare a bed by tilling or digging in a couple of inches (5 cm.) of compost or rotted manure down to a depth of 8-12 inches (20-30 cm.). Peanuts fix their own nitrogen so do not need much in the way of fertilizer, but they do need plenty of calcium. To add calcium into the soil, amend it with gypsum. 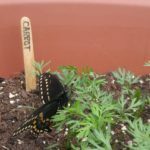 Plant the peanut seeds after the soil has warmed, about three weeks after the last frost. Soak the seeds in water overnight to stimulate germination and then plant seeds less than 2 inches (5 cm.) deep, and 4-6 inches (10-15 cm.) apart. The peanut seedlings will appear about a week after sowing and will then grow slowly for a month. Don’t worry; growth is occurring but just under the soil’s surface. When you see four leaves above the soil line, the plant no doubt has about a foot of taproot along with lateral roots. Peanuts do like heat, but they need regular watering. Soak the plants deeply once or twice a week. Pay special attention to consistent watering 50-100 days from sowing when the pods are nearing the soil’s surface. As the plants near maturity, allow the soil to dry out. While growing, Valencia peanuts don’t usually need any fertilizer if the soil has been amended prior to sowing. But if the plants look peaky, it’s fine to give them a diluted amount of fish emulsion just after the emergence of the seedlings, and then only that one time. Peanuts are susceptible to fertilizer burn, so be judicious with fertilizer application. Read more articles about Peanuts.